When the people we love so much, pass away, we tend to feel alone and lonely. We feel that the world is a cruel place, that it does not give the chance to live long and die old. 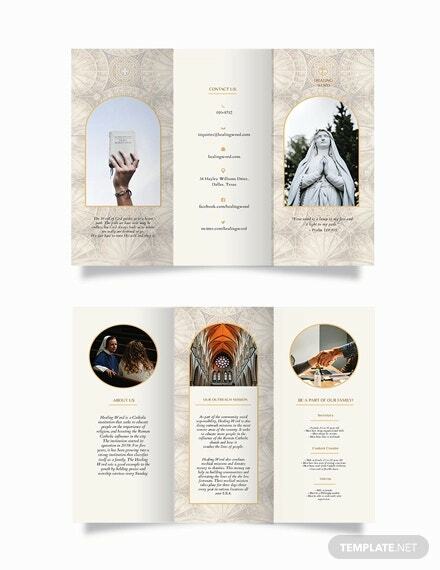 Regardless, a high quality, a multipurpose template is what you need to communicate the death and absentee of someone who was special to the Catholic Church. Of course, you could create the Obit templates from scratch, but in most cases, that’s unnecessary. The template is easily editable, so you can get your text ready in minutes. It is important to keep in mind that the template is editable in Photoshop only. The premium template is of high quality and worth the cost. If you are looking for a template that’s worth buying, consider this one. The template features color mode. The model is print-ready. In addition, the text on the template is 100% editable. The first thing you will probably notice when you look at this template is the content arrangement. Moreover, it features commercial free fonts, color mode, and free images. It also supports bleed. 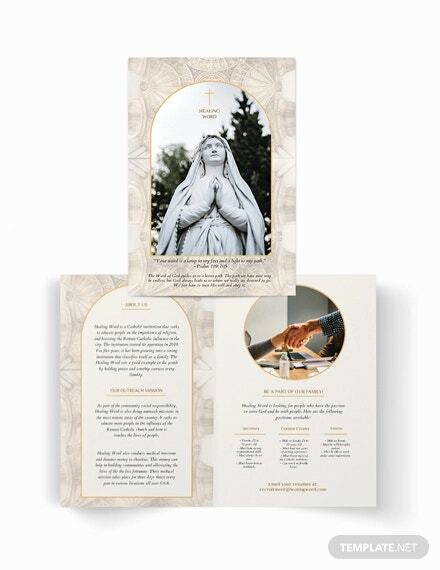 If you are looking for the perfect template, something worth your money and time, you should use this Photoshop Document Catholic Bi-Fold brochure. 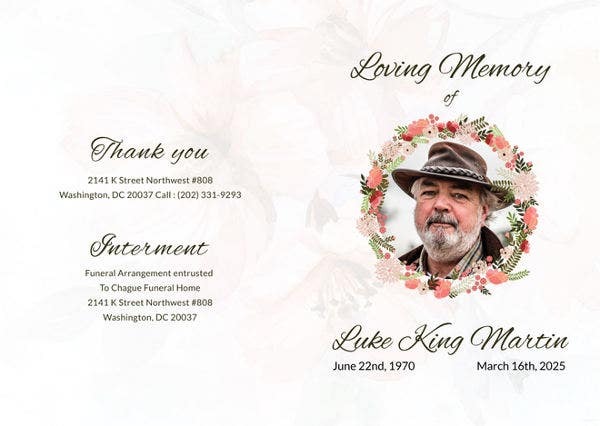 The brochure is perfect for writing an obituary. The Bi-Fold brochure features the CMYK color mode, commercial free fonts and replaceable images. The template is easy to edit in Adobe Photoshop. Moreover, the document is cheap and affordable. 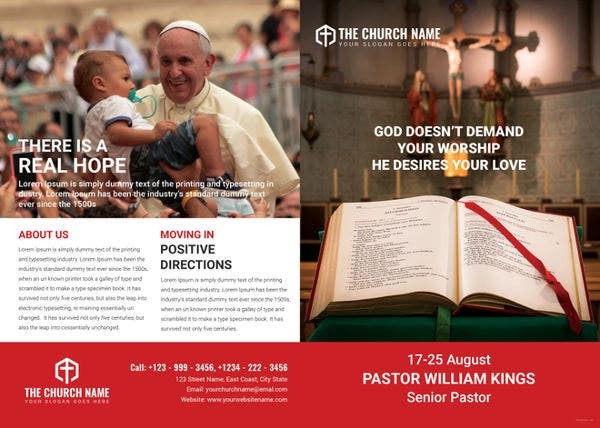 > Who Should Use the Catholic Bi-Fold Template? Catholic churches do appreciate the presence of their members in good and bad times. While this template always sends the message of sadness, it is likely to bring many people together for one purpose: to pay the last respect to the departed soul. However, the use of this template isn’t just tied to catholic churches. 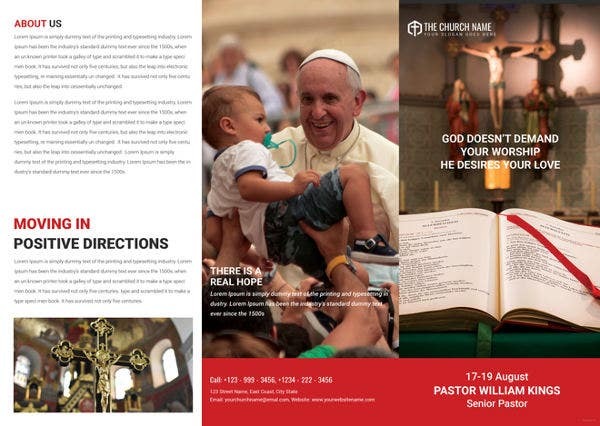 Catholic Church members too can use the Catholic Bi-Fold Brochure to announce the death of a person they loved so much. While the message is usually the same, the purpose of sending the messages about the death of a loved one is usually to bring people together during the bad times. 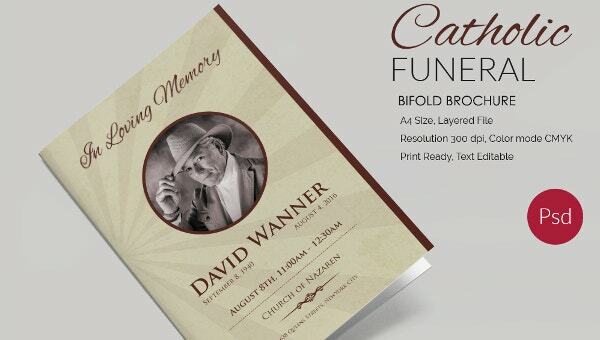 You can also see Funeral Service Brochure Templates. 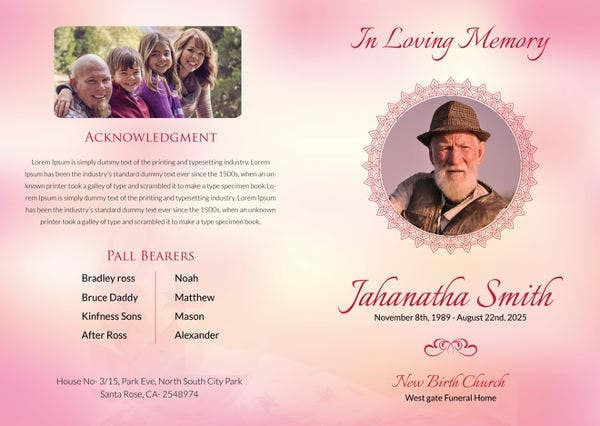 We know for a fact that creating a funeral template from scratch can be a painful task, even if design is your forte. On the one hand, you end up spending hours to complete the layout; on the other hand, putting content on it can be somewhat a challenge. Luckily, the predesigned template saves you a lot of time and money. In fact, all you ever have to do is download the premium template with the click of a mouse and customize the model for your personal use. 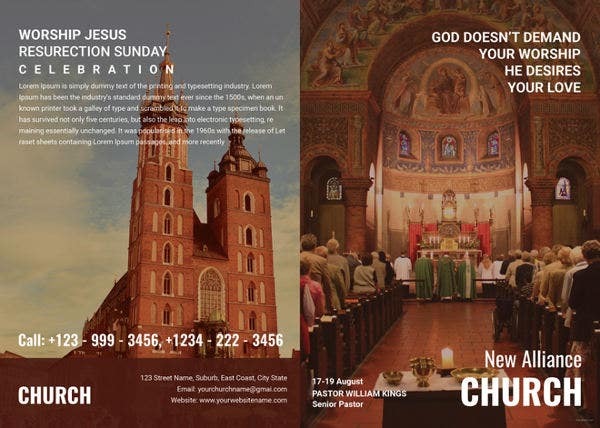 While there are many free brochures that you can download from the web, you can be sure that the premium templates provided for the Catholic Church are the best. Moreover, the ease to edit text and replace images in Microsoft Word and Adobe Photoshop makes the template the best to use.